Tag line: "This was the day the universe trembled before the demon forces of the killer planet!" A master of the macabre, Mario Bava continues, to this day, to rank as one of horror’s finest directors, and some of his movies (Black Sunday, Black Sabbath) are among the genre’s all-time greats. With 1965’s Planet of the Vampires, the legendary filmmaker also tried his hand at science fiction, and while his genius does occasionally shine through, the movie itself is only moderately successful. Two spaceships, the Argos and the Galliot, are on their way to a distant planet to investigate a series of radio transmissions. Captain Mark Markary (Barry Sullivan), commander of the Argos, is convinced these signals indicate there’s life on what was believed to be a desolate rock, but Captain Sallas (Massimo Righi), in charge of the Galliot, remains skeptical. As the ships approach their destination, the Argos malfunctions and is sent hurtling towards the planet at an incredible speed, causing its crew members to lose consciousness. But instead of crashing on the surface, the Argos comes in for a perfect landing, and as its crew slowly wakes up, they inexplicably start attacking one another. Luckily, cooler heads prevail, and Capt. Markary and his 8-person team, which includes engineer Wess (Angel Aranda), navigator Sanya (Norma Bengell) and ship’s doctor Karan (Fernando Villena), try to contact the Galliot to see how it fared. Instead, they receive a distress call from Capt. Sallas, and when Markary and a small detachment investigates, they find everyone on the Galliot dead (by all appearances, they killed one another). As Wess works on repairing the Argos, Markary and the others bury the Galliot’s deceased. But soon after doing so, several people report seeing the men of the Galliot walking around, as if they rose from their freshly-dug graves! When a few members of the Argos's crew also perish under mysterious circumstances, Markary and his dwindling team must work fast to figure out what’s going on before they, too, join the ranks of the dead. Well known for his prowess as a visual filmmaker, Bava blows us away in the very first scene by bringing us into the command center of the Argos, a vast, dimly-lit area filled with colorful control panels (there’s no dialogue whatsoever as the camera sweeps through the room, watching the crew as they work diligently to pilot the ship). The eye candy continues on the planet’s surface, and a late scene in which Markary and several others investigate an alien vessel (which crash-landed hundreds of years earlier) was an obvious influence on the “Space Jockey” sequence in Ridley Scott’s Alien. Even the various uniforms are fascinating, and the look of the risen dead will remind you more of a George Romero zombie film than a vampire flick. 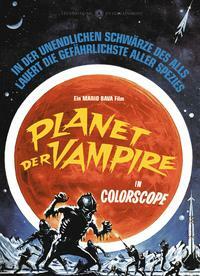 Yet while Planet of the Vampires is, indeed, a gorgeous motion picture, it’s also quite dull. After the excitement of the initial scenes (the crash and the various fights that break out on board the Argos), the movie slows down to a snail’s pace, following Markary and the others as they wander the planet’s surface, and stand around discussing their damaged ship as well as what's happened to the Galliot and its men. The film’s elaborate sets, and the manner in which Bava explores them, are enough to keep you watching, but the story (or lack thereof) may just put you to sleep.